The Digital India programme is a flagship programme of the Government of India with a vision to transform India into a digitally empowered society and knowledge economy. The journey of e-Governance initiatives in India took a broader dimension in mid 90s for wider sectoral applications with emphasis on citizen-centric services. Later on, many States/UTs started various e-Governance projects. Though these e-Governance projects were citizen-centric, they could make lesser than the desired impact. Government of India launched National e-Governance Plan (NeGP) in 2006. 31 Mission Mode Projects covering various domains were initiated. Despite the successful implementation of many e-Governance projects across the country, e-Governance as a whole has not been able to make the desired impact and fulfil all its objectives. It has been felt that a lot more thrust is required to ensure e-Governance in the country promote inclusive growth that covers electronic services, products, devices and job opportunities. Moreover, electronic manufacturing in the country needs to be strengthened. In order to transform the entire ecosystem of public services through the use of information technology, the Government of India has launched the Digital India programme with the vision to transform India into a digitally empowered society and knowledge economy. The vision of Digital India programme is to transform India into a digitally empowered society and knowledge economy. Ministries / Departments / States would fully leverage the Common and Support ICT Infrastructure established by GoI. DeitY would also evolve/ lay down standards and policy guidelines, provide technical and handholding support, undertake capacity building, R&D, etc. The existing/ ongoing e-Governance initiatives would be suitably revamped to align them with the principles of Digital India. Scope enhancement, Process Reengineering, use of integrated & interoperable systems and deployment of emerging technologies like cloud & mobile would be undertaken to enhance the delivery of Government services to citizens. States would be given flexibility to identify for inclusion additional state-specific projects, which are relevant for their socio-economic needs. e-Governance would be promoted through a centralised initiative to the extent necessary, to ensure citizen centric service orientation, interoperability of various e-Governance applications and optimal utilisation of ICT infrastructure/ resources, while adopting a decentralised implementation model. Successes would be identified and their replication promoted proactively with the required productization and customisation wherever needed. Public Private Partnerships would be preferred wherever feasible to implement e-Governance projects with adequate management and strategic control. Adoption of Unique ID would be promoted to facilitate identification, authentication and delivery of benefits. Restructuring of NIC would be undertaken to strengthen the IT support to all government departments at Centre and State levels. The positions of Chief Information Officers (CIO) would be created in at least 10 key Ministries so that various e-Governance projects could be designed, developed and implemented faster. CIO positions will be at Additional Secretary/Joint Secretary level with over-riding powers on IT in the respective Ministry. For effective management of the Digital India programme, the programme management structure would consists of a Monitoring Committee on Digital India headed by the Prime Minister, a Digital India Advisory Group chaired by the Minister of Communications and IT and an Apex Committee chaired by the Cabinet Secretary. The structure has the needed secretarial/ monitoring/ technical support and appropriate decentralization of power and responsibility to ensure effective execution of the various projects/ components by the implementing departments/ teams. Cabinet Committee on Economic Affairs (CCEA) for programme level policy decisions. A Monitoring Committee on Digital India under the Chairpersonship of Prime Minister which will be constituted with representation drawn from relevant Ministries/ Departments to provide leadership, prescribe deliverables and milestones, and monitor periodically the implementation of the Digital India Programme. A Digital India Advisory Group headed by the Minister of Communications and IT to solicit views of external stakeholders and to provide inputs to the Monitoring Committee on Digital India, advise the Government on policy issues and strategic interventions necessary for accelerating the implementation of the Digital India Programme across Central and State Government Ministries/Departments. The composition of the Advisory Group would include representation from the Planning Commission and 8 to 9 representatives from States/UTs and other Line Ministries/Departments on a rotational basis. An Apex Committee headed by the Cabinet Secretary would be overseeing the programme and providing policy and strategic directions for its implementation and resolving inter-ministerial issues. In addition it would harmonize and integrate diverse initiatives and aspects related to integration of services, end to end process re-engineering and service levels of MMPs and other initiatives under the Digital India Programme, wherever required. Expenditure Finance Committee (EFC)/Committee on Non Plan Expenditure (CNE) to financially appraise/ approve projects as per existing delegation of financial powers. The EFC/ CNE headed by Secretary Expenditure would also be recommending to the CCEA the manner in which MMPs/ eGovernance initiatives are to be implemented, as well as the financial terms of participation for States. A representative of the Planning Commission would also be included in both the EFC and CNE. A Council of Mission Leaders on Digital India headed by Secretary, DeitY would be established as a platform to share the best practices in various existing and new eGov initiatives under Digital India and also to sensitize various government departments about ICT projects of DeitY. While the inter-departmental, integration and interoperable issues of integrated projects / eGovernance initiatives would be resolved by the Apex Committee on Digital India headed by Cabinet Secretary, the technical issues of integrated projects would be resolved by the Council of Mission Leaders. Further, considering the scope of the Digital India Programme and the need to look at issues such as overall technology architecture, framework, standards, security policy, funding strategy, service delivery mechanism, sharing of common infrastructure etc. at a programme level, it is proposed that the technical appraisal of all Digital India projects be done by DeitY, prior to a project being placed before the EFC/ CNE. This appraisal would cover issues relating to inclusion of adoption of Standards, utilization of Cloud and mobile platforms, consideration of security aspects, etc. The Secretary, DeitY or his representative may also be included as a standing special invitee to all EFC/CNE meetings, which are appraising/approving MMPs. It may be mentioned that the DeitY has already set up a Programme Management Unit, namely National eGovernance Division (NeGD) to provide support to departments in conceptualizing, developing, appraising, implementing and monitoring respective MMPs / eGovernance Initiatives. Institutional mechanism of Digital India at State level would be headed by State Committee on Digital India by the Chief Minister. 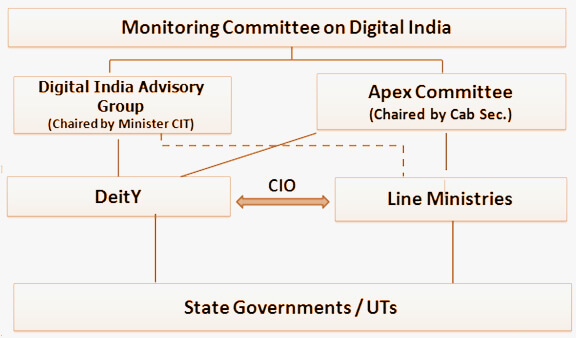 State/UT Apex Committees on Digital India headed by Chief Secretaries would be constituted at State/UT level to allocate required resources, set priority amongst projects and resolve inter-departmental issues at State level. For effective monitoring of Digital India, usage of Project Management Information System would be mandatory in each new and existing Mission Mode Projects to capture the real or near real time details about the progress of the project. This tool should be proficient enough to capture the parameters for each stage of project namely, conceptualization and development, implementation and post implementation. The parameters could be decided in consultation with various line Ministries / Departments and DeitY. Since the “e-Kranti: National eGovernance Plan 2.0” is already integrated with Digital India Programme, the existing programme management structure established for National eGovernance Plan at both national and state level has also been decided to be integrated appropriately with the programme management structure being envisaged for Digital India Programme at national and State/UT level. The Apex Committee on the Digital India programme headed by the Cabinet Secretary and the Digital India Advisory Group chaired by the Minister of Communications and Information Techology has been constituted. The first meeting of the Apex Committee on the Digital India programme was held on 26.11.2014. The second meeting of the Apex Committee on the Digital India programme was held on 09.02.2015. The actions on decisons made by the Apex Committee are being worked out.